Even sleeping an extra 15 to 30 minutes a night can help you feel rejuvenated and ready to tackle the world. When you do not get enough sleep, it leads to a cascade of negative events: your productivity at work will be affected, you may have to skip regular exercise or spending time with your friends and family, etc. Furthermore, snoozing your alarm and catching an extra 15 minutes of sleep in the morning does not actually count toward your total amount of deep restorative sleep. Forcing yourself to get up as soon as your alarm goes off will refresh you much more than snoozing your alarm. Get at least six hours of sleep per night. The top risk factor for burning out on a job is getting fewer than six hours of sleep a night. If you need an extra hour of energy tomorrow, add an extra hour of sleep tonight. Let your body and mind recover from the long day you had so you can be focused and productive tomorrow. Add sleep to your nightly schedule in 15 minute increments. Do this until you feel fully rested each morning. Add a constant background noise to keep your sleep uninterrupted if necessary. For example, try a fan, a noisemaker, or even a smartphone app. Use bright lights during the day and dim lights in the evening, and block all lights in your bedroom at night. Bright lights during the day will keep you awake, alert and focused. Dim lights in the evening will prepare your body for sleep, and pitch darkness at night will help your body go to sleep. This means that you can’t use any electronic devices for at least an hour before you go to bed, as the lights from these devices can mess up your sleep cycle. Keep your bedroom two to four degrees cooler at night. This will likely help you fall and stay asleep better. Do not hit the snooze button in the morning. 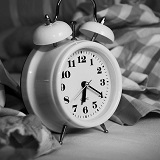 Set your alarm for the latest possible time so snoozing is not an option, then wake up and get out of bed when it rings. If you can, get rid of your alarm entirely; this is better achieved by waking up at the same general time every day, but is inadvisable for those who have to wake up extra early. Measure the progress of your sleep quality. As you practice good sleeping habits, measure your progress. Write down the time you get into bed and the time you wake up, and rate your sleep quality on a scale of one to 10. Do this every morning.